Early 1927 in Valleycliffe. Steam locomotives standing approximately where "townhouses" now stand. Far left: 14 ton Plymouth gas locomotive foreground: "North-western" speeder - Model T Ford engine. Right: 50 ton shay Loco #1 1 beam frame. Arch bar trucks. Behind her with crummies, 50 ton shay #2 (new) girder frame, cast frame trucks. Wagon to boiler. Shays converted to oil burners later in 1927. Merrill and Ring, an American company bought their claim in 1888 for 25 cents per acre. This went from Valleycliffe through the foothills to Brohm Lake. They did not set up in the valley until October 1926. The operation had come from Duncan Bay, before that they had been at Camp O near Alert Bay. Their first camp is where Valleycliffe is located now. They employed 200 people. The hiring was done by Loggers' Agencies in Vancouver. They would fall the trees with cross cut saws then haul the logs with a steam donkey to the train. They used a steam axe to split the wood as machines used only wood fuel at the time. A lot of Merrill and Ring timber was burnt in a Norton McKinnon fire in 1927. The McKinnon's engine was given as payment. Aloysius McNalley and John Broomquist collected it. The same year, Arthur Edwards assisted in the building of the Merrill & Ring camp at Edith Lake. In 1929, Merrill and Ring moved their operation across the Mamquam valley to Edith Lake east of Alice Lake. A settlement of 225 men was set up there. Railway track covered the mountainside from Cheekye River southward. Merrill and Ring closed in 1930 due to the low price of logs during the Depression. Logs were selling from 5 to 6 dollars per thousand. 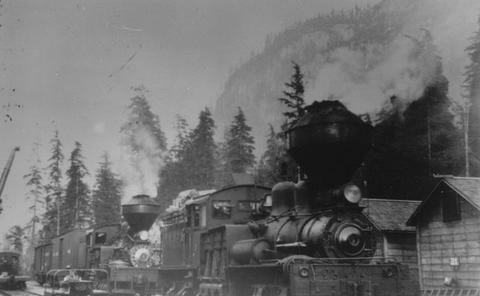 At this time, the logs were hauled by train to the dump at the mouth of the Stawamus River. Merill and Ring started back up in 1932. Merrill and Ring shut down 3 times in 1937: after New Years due to snow, due to fire season, and in the fall when a bridge over the Cheekye River was washed out. Merrill and Ring left Squamish in 1940. Squamish Public Library, Squamish Files, Industry.